This is just for a bit of fun and to recognise a wide range of runners, who perform well each month. I was trying to find someone new each month, but after starting in 2011 feel its time just to select someone, even if not the most obvious sometimes. Henry Pearce broke the TAC half marathon club record held by Ben Reynolds, since 1988, clocking 65.49 to finish 10th overall in the race won by Mo Farah in 61.39. Bede Pitcairn-Knowles (775) was a popular and surprising winner of the senior boys race at the Kent Schools Cross Country Championships, at Dover. 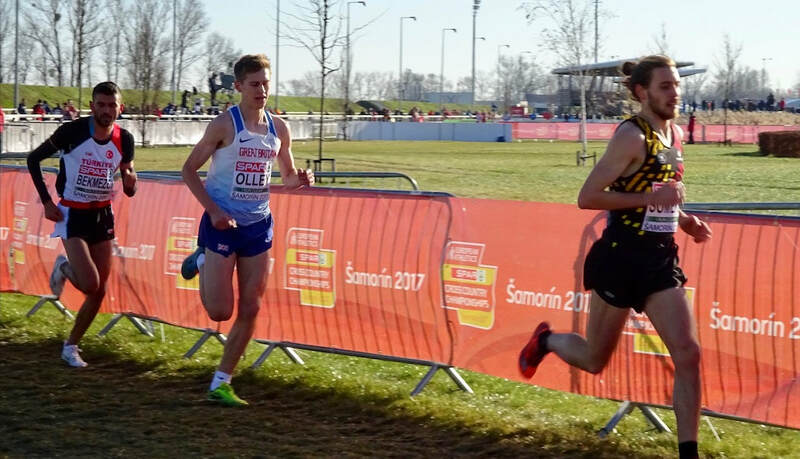 Chris Olley was 13th in the European under 23 Cross Country Championships and second scorer for GB, in Slovakia. 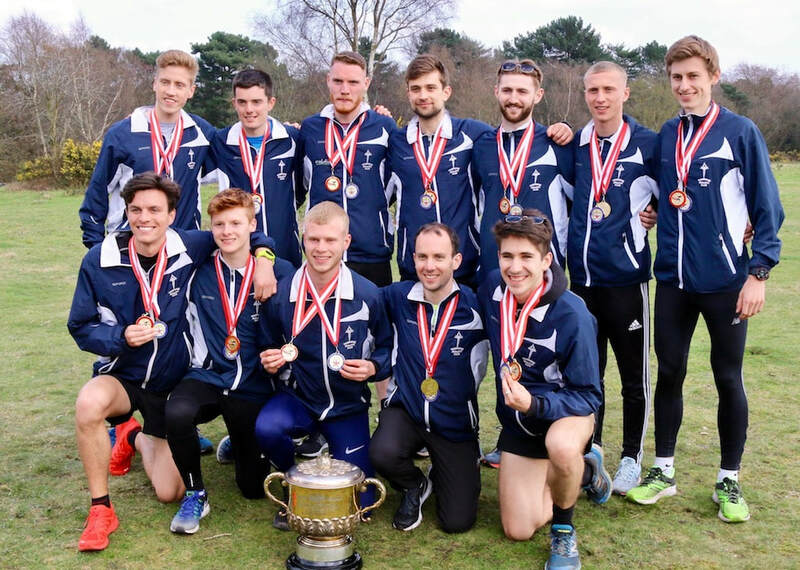 The Tonbridge mens team captured the National Cross Country Relays trophy at Mansfield, for the first time in the club's history. The team was George Duggan, Charlie Joslin-Allen, Ryan Driscoll and Chris Olley. Another team effort this month as the under 13 girls team finished second in the National Road Relay Championships, at Sutton Coldfield. The team was Sophie Slack, Anais Fernandez-Laaksonen and Olivia Breed. 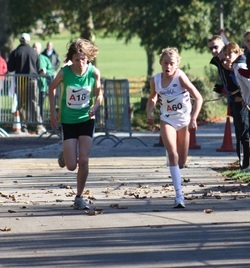 Olivia Breed ran the third fastest under 13 lap at the South of England Road Relay Championships, at Crystal Palace. Greg Cole won the South Downs 100km Challenge by an hour in 10.16.41. Its tough enough running 60 miles, let alone racing it over the hills of the South Downs. TAC had three male athletes under 8.05 for 3000m at Watford. Its the first time this has happened and maybe the first time more than one in a single race have achieved this. Chris Olley, Ryan Driscoll and James West achieved this, seen below with Corey De'Ath (left). I have picked Ollie Dunn for his brave front running 800m at the UK Youth Development League match, at Chelmsford. Ollie ran 54 seconds for the first lap and hung on to win in 1.57.9, his first time sub 2. 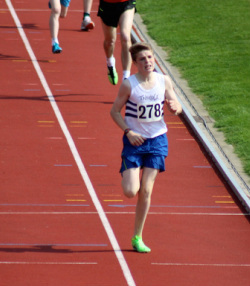 Charlie Crick continued his comeback with a win in the under 17 800m at the Kent Championships. Charlie was very good as an eleven year old, but after struggling for a long time, is now developing into a very good older athlete. 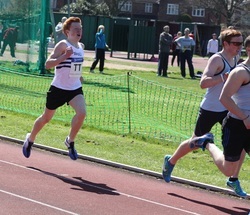 Simon Fraser (left) broke Alan Marriotts (right) TAC m40 600 metres record at the Tonbridge AC Easter Open Meeting. Simon ran an impressive 90.76 to take a second from Alan's record. March 2017 - Rebekah O'Brien indoor 800m title at Kent Championships. Quite simple this month - The Senior Men winning the National Cross Country Championships. Charlie Joslin-Allen, Ben Cole, Chris Olley, Kieran Reilly, Corey De'Ath and Max Nicholls. Fraser Gordon was a very popular winner of the Junior Boys race at the Kent Schools Cross Country Championships. Tom Holden joined TAC in the late Spring of 2016 from South London Harriers and has proved to be a terrific addition to the under 20 and senior mens squads. He was selected to run for the England under 20 team in Brussels and produced one of his best ever performances to win the race. I could have chosen the under 20 mens team of Tom Holden, Alasdair Kinloch and George Duggan, who won the National Cross Country Relay Championship, making it four in a row in that age group for TAC. However, the second place from the senior men was a terrific effort and the highest position that the club has ever finished. The team was Dom Brown, James West, Chris Olley and Alex Howard. 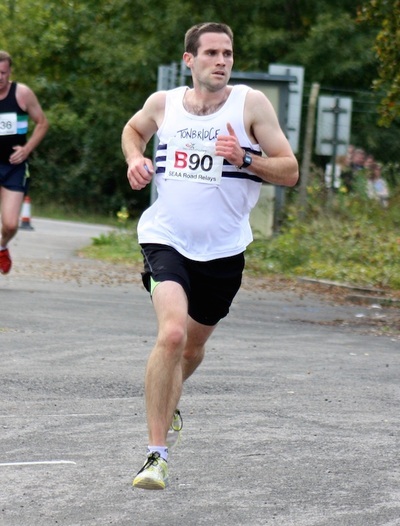 I initially had Mark Coates finishing 40th from 207 finishers at the Kent League as the performance of the month, but realised that he had previously been shown. Hence, its a senior mens performance in the 6 stage, National Road Relay Championship. They produced a time quicker than the previous year's gold medal winning team. The senior mens team finished in the highest ever place recorded by a TAC senior team at the South of England Road Relay Championships. Alasdair Kinloch (missing from photo) was joined by Ben Cole, James West, George Duggan, Corey De'Ath and Tom Holden. In August Bede Pitcairn-Knowles had one of his best ever performances when he ran a personal best of 4.31.48 to finish third in the National under 17 men's 1500 metres steeplechase final at Bedford. 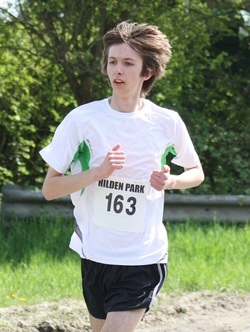 He is developing into one of the club's most dedicated young runners and has taken twenty seconds from his steeplechase time since last year. There were some top class performances in July, again from athletes who have featured here, such as James West, Nicole Taylor, Sean Molloy, Kathleen Faes, Phoebe Barker etc, but this month I am highlighting Joe Watts. As we are nearing the Olympics it also seems appropriate that Joe is mentioned, since he was one who joined soon after London 2012. Since then Joe has developed into a decent runner himself, but just as importantly initiated the Tunbridge Wells parkrun and started a training group in Southborough. Joe is a good example of the Olympic legacy. In July he took close to a minute from his Tunbridge Wells parkrun best with 18.53. Ollie Dunn has moved into the under 20 age group this Summer wth renewed determination and seems to be setting personal bests every week. In June he has improved his 800m to 2.03.00 (was 2.22.59 before this season), 1500m 4.16.76 (was 4.46.9) and 3000m 9.49.64 (was 10.17.53), plus also improving his mile pb to 4.41.05 from 5.08.11. Mark Pitcairn-Knowles has led the way in mobilising the TAC veterans in the Winter and is now doing the same in the Summer. Its been great to see the enthusiasm of so many turning out for TAC and PK. He only joined TAC in 2013, but has been a key member, alongside his family ever since. At the end of May he was part of a TAC squad that ran the London 10k on Bank Holiday Monday and was not afraid to voice his pre race target time. So it was quite impressive that he came away with a big pb of 37.49. If a TAC team betters any previous club performance, at a National Championships, then it is likely they will be shown here as 'Performance of the Month'. The National 12 stage is possibly the most prestigious team event in the UK distance running calendar and this year the TAC team's 5th place equalled last year's best ever. However, on this occasion it was not only a more solid 5th, but closer to the winners. March was a month when some previous 'Performance of the Month' winners were really on form. Kathleen Faes won the under 15 UK Inter Counties Cross Country Championships and with Phoebe Barker finished 2nd and 3rd in the Schools Home international. 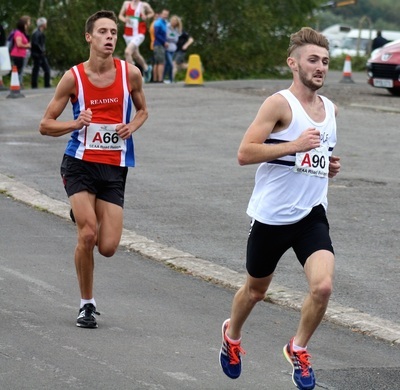 Chris Olley won the under 20 mens race for England, at the Home International and recorded the third fastest ever road 10km, by an under 20, with 29.42. However, this month I am mentioning Mark Coates, who won the Bedgebury parkrun on 26th March, at what was the second ever parkrun at the venue. Mark has been first home in three other parkruns, but I feel he deserves a mention here, as he has battled away for a few years now at the club, overcoming difficulties and representing the club regularly. Phoebe Barker surpassed all her previous performances to place a splendid 6th in the under 17 National. This was the highest position achieved by a TAC female at the championships. Phoebe is a great example to many in perseverance, having had her ups and downs in the sport, but has continued to work hard and sensibly prepare for training and races. James Stoney stepped up a level at the Kent Schools Championships, to mix with some older counterparts in the Inter Boys age group. Despite being in the bottom year of the years 10 and 11 event, James ran a very well judged race to take second behind James Puxty. With many of the winners and high finishers having 'won' the Performance of the Month previously, this is a good chance to recognise a performance slightly further down the field. Michael Ellis finished 29th of 177 finishers, at the South of Thames Championship and took the scalps of a few that he hasn't beaten before. The ex Judd School pupil is at Sheffield Hallam University and is another of our current crop who consistently churns out 50+ mile weeks and is showing the benefits, as he reaches the senior age group. November saw a few highlights, such as Lucy Reid winning the South of Thames Team race over 5 miles, plus Chris Olley and James West racing for England in Spain. 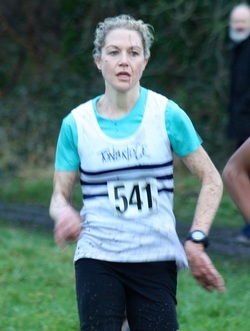 Alasdair Kinloch and Lizzie Miller took a couple of Kent League wins, whilst Ashley Gibson won the senior women's Kent League, at the end of the month. However, this month, I am highlighting Chloe Bird's run in 2nd place, behind Ashley, at the Kent League, since it was a 'breakthrough' performance, surpassing all that she has achieved before. Chloe is based at Nottingham University and has made steady progress in the last couple of years and hopefully the performance will propel her to even greater achievements. There can only be one selection for October, which is the senior men's team that captured the club's first ever national senior team title. The team below of Corey De'Ath, Ben Cole, Chris Olley, Kieran Reilly, Tom Cox and Henry Pearce won by five seconds, after nearly two hours of racing. 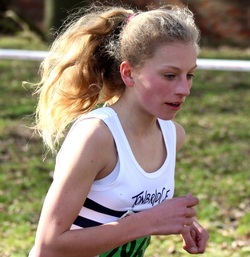 Katie Goodge underlined the fact that she is one of the most improved runners in the last 12 months, when she ran the 5th fastest under 13 lap, at the South of England Road Relay Championships. Katie finished the opening leg in second place and helped the team to an eventual 12th position. Ben Reynolds won the World Masters Championships over 50 mens 5000m in Lyon, France in 15.47.07. Ben has been a TAC member since he was at Sevenoaks School and has competed ever since, although is also a member of Thames Hare and Hounds. All of the above have appeared as Performers of the month, so for July I looked for the 'shock factor', which came from Simon Fraser ! Simon has started training well again as his 40th birthday beckons this year. In preparation of his appearance in the over 40 age group he has been racing again on the track. In July he ran 800 metres at Eltham in 2.04.26, which was his best time since 2007. It was so good that even his pupils at Judd School were impressed ! June saw some outstanding individual performances from the likes of Ryan Driscoll (National u23 steeplechase champion), Kathleen Faes (club u15 record at 1500m), Alice Ralph (club u17 steeplechase record), plus the likes of James West, Dom Brown, Chris Olley, Tim Faes. These are all amongst the 50 plus 'winners' of the performance of the month previously, so this month the highlighted runner is Fraser Gordon. Fraser is still in the under 13 age group and has improved from 2013, where he ran 1 mile in 6.55.40 (worth about 6.30 for 1500m). He ran 5.35.54 in 2014 and has now set a series of pbs, so far reaching 4.54.7. Ryan Driscoll racing 3000m in 8.10 and 3000m steeplechase in 8.58, Chris Olley's 14.18 for 5000m, Alice Ralph collecting double league wins at 800m and steeplechase, Max Nicholls winning the Inter Counties Fell race and the GB trials at Mountain Running, Kathleen Faes winning the Westminster Road Mile and I could go on. These have all 'won' Performance of the Month previously, so this month the title is held by Alex Howard. Alex is at Oxford University and was a relative late comer to running, despite being at Judd School. In May he produced two performances that not only surprised a few of us, but shook Alex himself ! Firstly, he finished 6th in the British Universities Championships at 3000m steeplechase in 9.16.60, taking 13 seconds from his pb. Then at the end of the month he won a 1500 metres race at Manchester in 3.54.78, improving by 5 seconds. April saw a number of outstanding individual performances. For example, Ben Cole ran the second fastest ever marathon by a TAC member with 2.27.34 at London. Sam Crick ran four pbs/debuts in a week at 800m, 3000m, 1500m steeplechase and even 400m hurdles. Then there was Ryan Driscoll who smashed the Southern League record by eight seconds in the 2000m steeplechase, even though he just lost the race. However, all three of these have been shown as 'Performance of the Month' before. 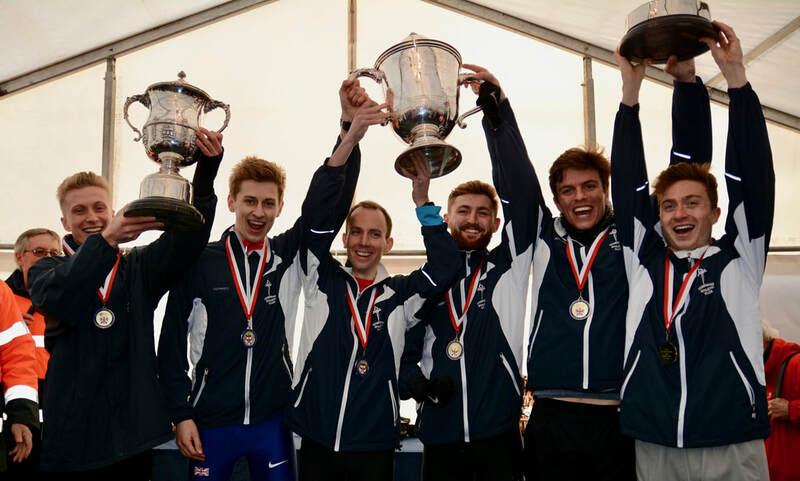 To be honest its difficult to ignore the claims of the mens 12 stage road relay team that finished 5th in the National Road Relay Championships, at Sutton Coldfield. It was the club's best ever team performance in a major 'National' and was achieved with half the team being in the under 20 age group last Winter. March, like so many recent months, witnessed a proliferation of top performances. Kathleen Faes completed an unbeaten season by winning the UK Inter Counties, English Schools and Schools Home Countries International. 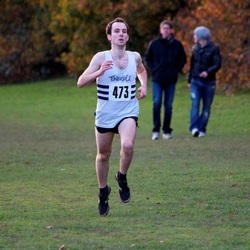 Chris Olley finished 4th in the UK Inter Counties and went to the World Cross with the GB under 20 team. Alasdair Kinloch finished 2nd in the English Schools and made the England team, finishing 3rd in the Schools International. Ben Cole ran a 67.52 half marathon, one of the quickest ever from a TAC athlete. 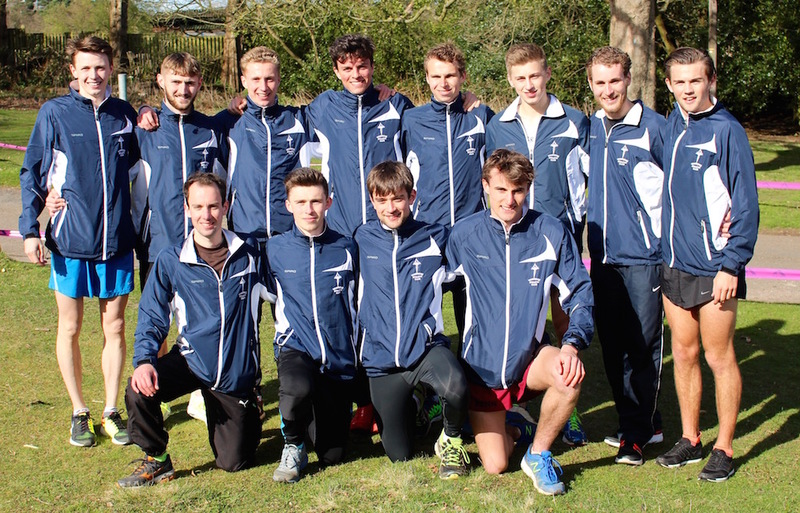 Then the men's and women's teams finished 4th and 11th, respectively, at the South of England Road Relay Championships, recording the highest ever positions for the club. All the individuals above have been shown as 'Performance of the Month' previously, so on this occasion it goes to TAC's other international in March - Jamie Goodge. 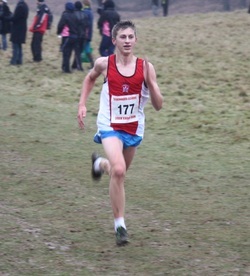 Jamie finished 7th in the English Schools Cross Country Championship and was selected for the England Inter Boys team. He then went onto finish 11th in the Schools International. On top of this Jamie placed 7th at the UK Inter Counties, in the under 17 race, despite having another year in the age group. In a month where TAC teams and athletes won five National Championships (u15,17,20 male teams, plus Kathleen Faes at National Cross Country and James West at 1500m indoors) I have chosen the performance that created perhaps the best surprise as the performance of the month. 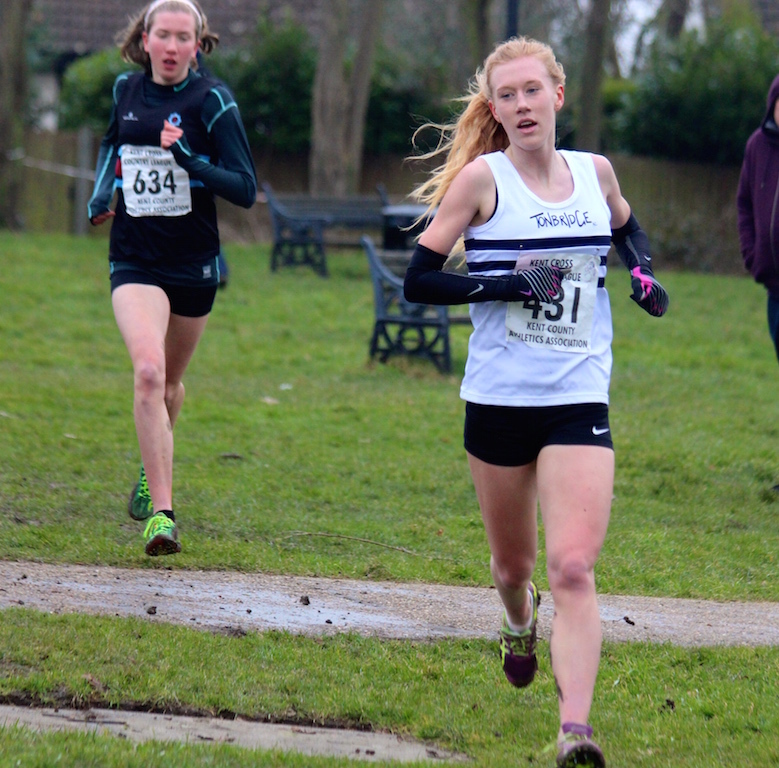 Alice Ralph won the under 17/20 women's race at the Kent Cross Cross Country League, in early February, a performance which not only boosted her confidence, but also that of some of her team mates. A study of Alice's powerof10 profile shows that she has been racing for the club for six years, since starting in the under 13 age group. In that time her highest previous Kent League position was 6th. So this was a big step up and hopefully the launch pad for a lot more to come. Once again the month saw many fine performances, such as Henry Pearce, almost winning the Surrey senior mens cross country championship or Charlie Joslin-Allen sixth in the British Cross Challenge senior race at Cardiff. Then we had the Southern Championships, where we saw wins for James Puxty and Kathleen Faes, whilst Ben Cole (12th) and Lucy Reid (17th) posted highest ever positions in the senior races. All those mentioned have produced 'Performances of the Month' previously, so I had a look at a few that have genuinely shocked me. Two stood out, both by athletes making a comeback. There was Nathan Marsh who, out of nowhere, finished 11th in the British Universities B-race, his first race back after being knocked off his bike, by a car, a few weeks back. Before that Tim Faes finished 12th in the Kent Schools senior boys race, having been out with a foot injury (football) for weeks. Tim was a bit disappointed, but had only completed three runs before the race ! He had, however, kept fit with cross training. Then on the final day of the month Tim finished 7th in the South East Schools Inter Counties Championships, showing a great example to those who have been out ill or injured. Andrew Mercer takes second place in Kent Masters over 40 championships, on TAC debut. Its getting more and more difficult to select an individual who has not been shown as Performance of the month previously. It also feels a bit like cheating to continually select team performances. December was a case in point as there were some superb individual performances, such as Kathleen Faes winning in Brussels, Nicole Taylor third at the same venue, Ben Cole taking third in the South of Thames Championship and Lucy Reid being second female there aswell. We also had the senior men taking the team title at the South of Thames, for the third year in a row. At the Kent Veterans Championships, Ben Reynolds won the over 50 race and led the Tonbridge team to victory. However, Ben is a second claim member of TAC, belonging to Thames Hare and Hounds. A performance that particularly caught the eye at those championships was that of Andrew Mercer. 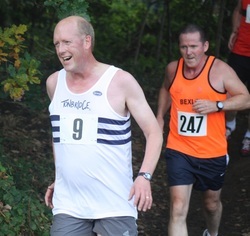 He was making his tAC debut and placed second to the National over 40 winner, Chris Greenwood of Kent AC. Andrew is a prolific parkrun winner at Tonbridge, but hopefully will be available in more events this year. Sometimes its easy to take winning for granted when TAC have won a number of national age group titles in recent years, but I am sure, that when we look back in future years, we wont do. Chris Olley, George Duggan and Charlie Joslin-Allen may well have been the favourites to win, but the cross country relays allow for very little margin of error. A few seconds lost by one runner, with a below par performance, can make a big difference, when the distances covered are relatively short. These three put in a sublime performance, carrying out a tactical master class. Chris gave the team a solid start to put us amongst the leaders, George hit the end of his leg hard to give Charlie a lead and Charlie started so fast that no other team got a sniff of opportunity. It was a convincing win and achieved despite George only been called into the team on the morning of the event. Well it is the relay season so perhaps fitting that another team gets the nomination this month. Charlie Joslin-Allen. Henry Pearce. Ryan Driscoll. Steve Fennell and Tom Cox. Once again I have to pick out a team performance, at it has surpassed anything that the club has achieved previously. 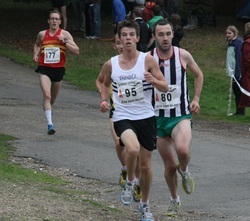 The mens team of six finished 4th in the South of England Road Relays, which bettered the previous best by a place. The six were Ryan Driscoll, Steve Fennell, Charlie Joslin-Allen, Ben Cole, Tom Cox and Henry Pearce. Other terrific performances in September included the women's team finishing 9th at the road relay championships, which was also the club's highest ever position. The team was Nicole Taylor, Sian Driscoll, Lucy Reid and Grace Nicholls. The under 17 men of Stuart Brown, Chris Cohen, Jamie Goodge and Alasdair Kinloch won. 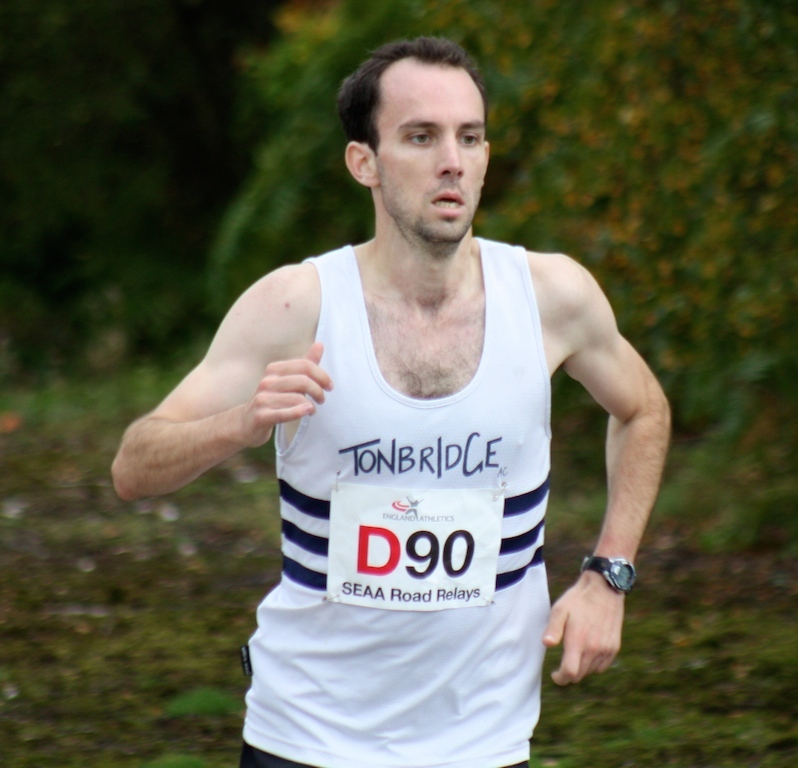 Outside of the road relays, Julian Rendall had victories at both the Eridge Ten Mile Trail Challenge and the Tonbridge Half Marathon. Since joining the club a couple of years ago, John has been mainly known as a road racer, over half and full marathons. However, in August he decided to try his hand at a spot of track racing. In the TAC Open Meeting he first set a club over 60 1500m record of 5.20.47 and then in the Tonbridge event, on Bank Holiday Monday ran a 3000m in 11.40.05. It was interesting to see the 1500m record survive an attack from Brian Buckwell, also in late August. Other notable performances in August included Chris Cohen and Kathleen Faes winning South of England Championships, plus Max Nicholls gaining GB selection for Mountain racing. All three of these athletes have appeared in the Performance of the month feature, before. Kathleen Faes won the National Prep Schools 1500 metres championship in July and then went onto finish 7th in the English Schools, despite having another year in the age group. In the Prep Schools event Kathleen lowered her personal best time to 4.35.83, which is the fastest by a TAC female runner in 2014. Other excellent performances in July were produced by the likes of James West, Ryan Driscoll, Charlie Crick, Dominic Brown and Nicole Taylor, although all of these have 'won' this performance award previously. Christian Lee is another of TAC's under 15s who have shown great improvements in the last year. 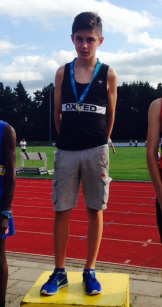 He has improved his 800 metres personal best by 12 seconds to 2.06.01 and won the Surrey Schools Junior Boys title. Unfortunately, despite having the entry standard, he wasn't selected for the English Schools Championships. Christian, like Sam, from May, is another who has improved mainly because he has a passion for the sport, so enjoys training and racing. This consistent approach does tend to pay off. June has also seen a number of comeback performances such as Andy Combs finishing second in the South of England 5000 metres and Catherine Symons breaking a three year old 1500m pb. However, maybe the most dramatic was Toby Ralph running a 55.9 400m relay split, just ten days after having a corrective heart procedure ! Sam Crick has had a tremendous start to the Summer season, but the foundations were built across the Winter months. Sam has been very consistent with club nights, Monday runs, plus Wednesday circuit training and is now reaping the benefits. Initially I thought it was the case that Nicole Taylor had not appeared in this 'Performance of the Month' feature, but was mistaken. Nicole appeared in 2010. However, May was a terrific month for her, as she finished third in the British Universities and Colleges Championships, represented 'BUCS' at the Loughborough International Meeting and set Tonbridge AC club records at three distances. Nicole's 1500m steeplechase time was the 4th fastest ever in the UK for an under 20 woman. Other standout performances in May included Dominic Brown (4th BUCS 1500m), Christian Lee (pb and big improvement), Jamie Bryant/Cameron Knapp/Max Nicholls/Miles Weatherseed (all sub 2 at 800m for 1st time), Ellie Cohen (back to form), Chris Olley (massive 1500m pb), George Duggan (winning Westminster Road Mile), Ryan Driscoll (3000/5000m pbs) and many more. Its four years since I started this web site and this is the 49th Performance of the Month. It gets more difficult, since one the rules is not to have anyone appearing here a second time. This rules out athletes like Sean Molloy (club under 20, 600m record) or Chris Olley (big 3000m pb) etc. However, one of the best performances came from Genny Allan, who quietly opened her track season with a massive personal best over 1500 metres of 4.46.18. This took 18 seconds from her previous time. Genny recorded this at the first Watford open meeting of the season. James West finished second in the UK Indoor Under 20 men's 1500 metres championship and was selected for the England team. James then finished third in the match against Wales. James is to the left in the photo. The under 20 men's team won our first National Cross Country title in this age group, since 1986. Although Robbie Farnham-Rose, Ryan Driscoll, Corey De'Ath and Max Nicholls were the scorers on the day, it really is a wider team effort. The squad was missing four junior internationals and could have fielded another team of four capable of winning the title. It seems appropriate that the squad is mentioned here, as quite a few will move to the senior ranks now, having raced and trained together for a number of years through the age groups. Without a doubt we have the strongest depth of distance runners in this age group, within the UK. The big question now is whether enough of them can translate junior success to senior performances. Whenever a senior team from the club produce a performance better than anything previously achieved then they are likely to get the nomination in this section ! This is the case with our six to score men's team who finished in 6th place of 74 clubs at the South of England Championships. 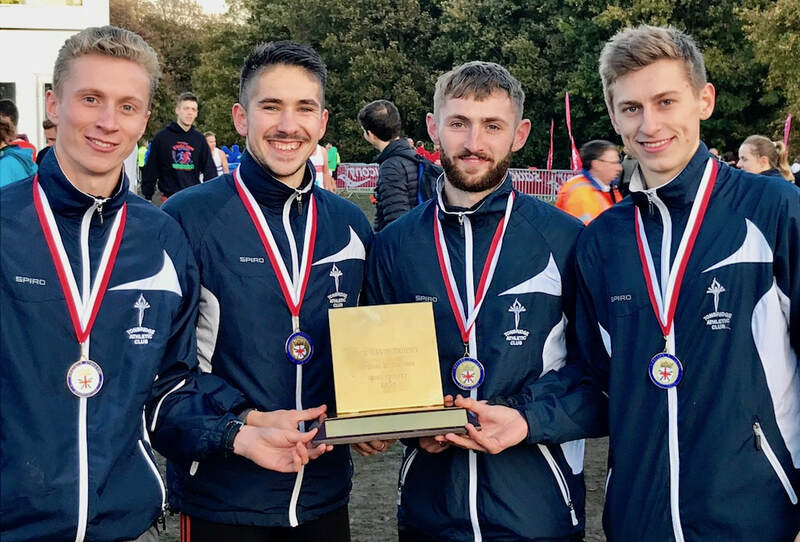 Competing over the traditional three lap and nine mile long course at the 'home' of English cross country, at Parliament Hill, they finished in the highest ever position by a TAC senior team. The team of Tom Cox, Ben Cole, Dan Bradley, Julian Rendall, Dan Watt and James Taylor were only a a few points away from fourth place. The mud was thick, the competition strong and most people had gone home before their race started. However, they all fought hard and had to since, if any of the six had not performed, we would have slipped some way down the finishing order. Deirdre McDermot won the South of Thames Cross Country title at Wimbledon Common, just before Christmas. Run over a 7.5 mile course Deirdre put more than two minutes between herself and the second lady to finish. This was probably the most prestigious title that a TAC senior lady distance runner has ever won (at least I can't think of another !). She also helped the team to silver medals, which was the first time that a TAC women's team has achieved anything like this, outside of a county championships. Deirdre teaches at Tonbridge School and due to Saturday work commitments finds it difficult to compete for TAC on a regular basis. 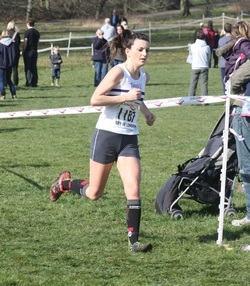 However, she has previously won Kent league races and the overall league title. Dominic Brown produced a couple of significant performances in November. 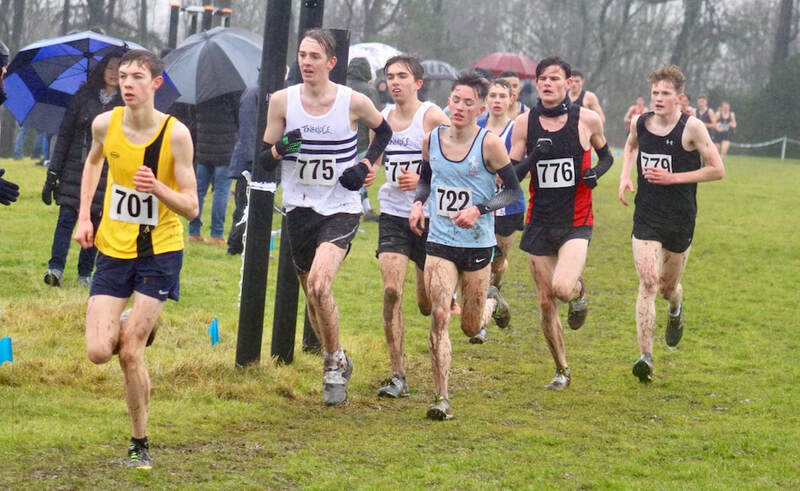 Firstly he justified his selection for the under 20 men's A-team, by running a storming second leg at the National Cross Country Relay Championships. This helped the team, with Dom, alongside Ryan Driscoll and Robbie Farnham-Rose, to win the race. Later in the month Dom finished 11th at the British Cross Challenge event, at Liverpool and as a result has been selected to run for England, in Brussels. Whenever a team wins a National Championship they deserve the Performance of the month nomination. Chris is 'bottom' of the under 17 mens age group now, but is showing a determination to train hard and compete with the very best in the country. I have been so impressed with his willingness to state his ambitious targets and then go and achieve them in the last year. His track times came down substantially this year and he continues to develop. He ran a fast first leg at Aldershot, that followed on from a very good performance at the Blackheath and Bromley relays the week before. The last time that James Pigot set personal bests for 800 and 1500 metres was in 2008 ie five years ago. Since then James finished at Tonbridge School and started at university in London, as a medical student. His athletics career has been stop-go for all those years, interrupted by niggling injuries and studies. Before August his pbs stood at 2.02.15 and 4.12.4 and had shown little sign of being reviewed ! Now, at the end of August, James has run 1.59.86 and 4.04.76, both in Watford open meetings and has renewed his love of the sport. James is due to start working in a London hospital shortly, with awkward shifts and teh like, but whatever happens from now he can say he broke two minutes for 800 metres. I think James was quite surprised to make these jumps forward with his times this Summer, especially as he nears his 22nd birthday. However, he is a good example to many that perseverance and patience can pay off. July was another month that saw a good number of terrific performances by TAC distance runners. Steve Fennell ran 4.05 for 1 mile: Tom Kendrick came close to the UK age 13 record for 1500m with 4.08.70: Becky O'Hara continued to go further below 60 seconds at 400m. Then Alasdair Kinloch and Jamie Goodge ran outstanding times to finish 1st and 2nd in the Southern under 15, 3000 metres. However, I have selected Kieran Reilly's 3000 metres in 8.15.33 as the top performance. It represents what we are trying to achieve ie fast times at senior level. Kieran's time was a personal best and also the fastest by a TAC athlete for at least 15 years. Tonbridge AC is not just about winning national titles or setting records, as among the many distance runners we now have at the club are a few quietly going about their business and improving all the time. A good example of these athletes is Peter Mills, who has yet to be near the front of races, but really enjoys his running. I have seen Peter frequently out on runs around the Tonbridge area, from his home and he is a regular for the long Sunday run. 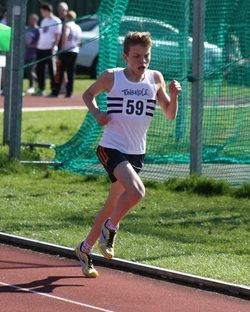 In June Peter, as an under 17, ran 3000 metres in 10.28.48, which I believe shows that he is taking great steps forward. He followed that up by putting his name forward for a Southern Athletics League, at 5000m and made his debut at the distance, on the track, running 18.49.5. I suspect, like Peter, there are others within the crowds of young athletes at TAC who will come to the fore, simply due to their love of the sport and willingness to put in the training needed. May witnessed some excellent performances and if they hadn't won the 'Performance of the Month' title before then the likes of George Duggan (TAC u17 1500m record), Ben Cole (10k pb by 47s), Nicole Taylor (club 2k steeplechase record) and Corey De'Ath (big pbs in 800,1500 and 3000m) might have been nominated. 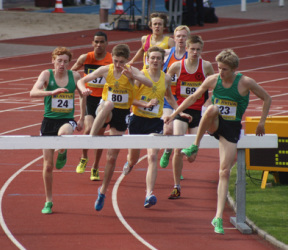 However, on this occasion, after scanning all the results, I felt that the way Euan Nicholls bounced back between a tired looking 1500m steeplechase at the Kent Champs to then decimate his 1500m pb, just three days later, deserved the nomination. Euan's example is a good one in that an athlete can have an off day, but if you are positive then it is possible to rebound quickly. Euan ran 4.19.52, which took eight seconds from his pb and more than ten seconds from the best that he had run this season. Toby is the second member of the Ralph family to get a mention here in recent months, following 'dad' Duncan. When looking at the April performances Toby's improvement from his best last year at 800m of 2.06.51 to his 2.01.47 in April stood out. He ran the time in his first 'senior' league race at Eltham. The other performance that caught everyone by surprise was Peter Mills in the National Road Relays, who maybe ran a minute quicker than we anticipated. Hopefully, he can follow this up and show how he is on another level of performance, after training consistently throughout the Winter. Alasdair Kinloch was selected for the England Schools, Junior Boys (years 7 and 8) team) to compete in the Home Countries Cross Country International. Ally placed 8th in the English Schools Championships, but improved in the International to finish 5th and score for the winning England team. Ally joined Tonbridge AC in June last year, from Thanet Road Runners. He has a had a successful Winter season, both as an individual and part of the TAC under 15 team. Infact, he is young enough to still be in the under 15 age group this Summer and again next Winter. This month there were so many good performances, with both the under 13 boys and under 17 men winning National team titles, Tom Kendrick winning the National under 13 championship and Robbie Farnham-Rose running an indoor mile in 4.02.34, for a UK under 20 record. Some of the above have 'won' the performance of the month before, so I am going for a different angle this month and selecting Lowri Richards. Lowri has come through various ups and downs, since she was in the under 15 age group at the club and made it to the snior ranks. On a number of occasions she has been our lone senior lady competing in a championship, such as at the Southern. There, at Parliament Hill, she was 64th, which was the club's highest ever placing in the event. She then did the same when she finished 127th in the National. We all have our fingers crossed that she can improve again over the next year and also lead the senior women's team to success. With the Kent Schools, Sussex Schools, Surrey Schools and South of England Cross Country Championships all being postponed until February, the month of January was frustrating for many. 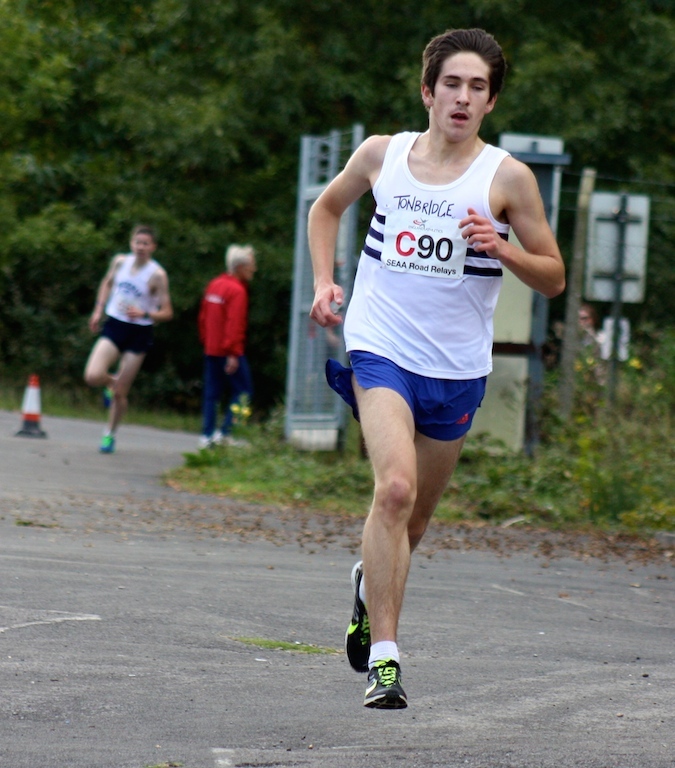 The county championships on the first weekend produced some fine performances but when looking for a performance with the 'Wow' factor it would be Chris Olley's second place finish in the Knole Run. Nathan Marsh, in third, also had his best ever performance. Chris boards at Sevenoaks School, whilst during the holidays goes back home to Cyprus. However, he has followed a tough training schedule on his own this Winter and targeted the Knole Run in particular. He improved from 23rd in 2012 to 2nd this year. December continued with many pleasing performances, including Nicole Taylor winning the Reigate Holly Run, with the womens' teams also victorious there. Also for the first time in TAC history the senior men won the South of Thames Championship race and Tom Cox ran his first ever international for England. Nicole and Tom have been highlighted with performances of the month before, whilst I have decided that at the end of 2012 it would be appropriate to highlight something a little different. One of the positive developments at TAC in 2012 has been the continuing increase in the number of parents getting involved with training and also even racing. This resulted in the highest number of competitors that we have ever had at the Kent Veeterans Cross Country Championships. Amongst them was Duncan Ralph, who a year ago wasn't even jogging. Now 12 months later and three stone lighter Duncan has completed quite a few races and is soon to take on the 9 miles of Parliament Hill, in the 'Southern', whilst he is part of our National squad. In December Duncan finished a Kent Cross Country League and the Kent Veteran's Championships, whilst he was also a regular at training, including the long Sunday morning runs and Knole Park relays. Step by step Duncan has become fitter and stronger and is now within striking distance of one or two other athletes at TAC and maybe looking to inflict some defeats on them in 2013 ! It is becoming extremely difficult to select one single performance of the month, from a team or individual, that has not been shown here previously. In November, we had the likes of Tom Cox (Kent League win and England selection), Sophie Foreman (Kent League 3rd, plus 6th in u17 race at Liverpool) and Corey De'Ath (Kent League win and 4th in u17 race at Liverpool) all having more than one performance that maybe bettered their previous races. 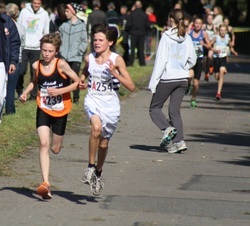 Then there was James Puxty, who fell over on the first leg of the u13 race, in the National Cross Country Relays, got up to find himself in last place and managed to get up to ninth place at the handover. However, all of these have 'won' the performance of the month before, as has Sean Molloy, who anchored the u17 team to a win at Mansfield and Graeme Saker who won the over 50 age group home international. So I have had to think hard about who to select this month and have gone with Cameron Knapp and his run in the under 20 race at Mansfield. His time of 9.40, was far quicker than we expected and was no doubt his best ever run. Cameron backed this up with an excellent 10th place in the South of Thames Team Race, at Reigate, which helped the men to victory there. He is also one of the most respected athletes at the club and has worked hard to improve significantly this year. 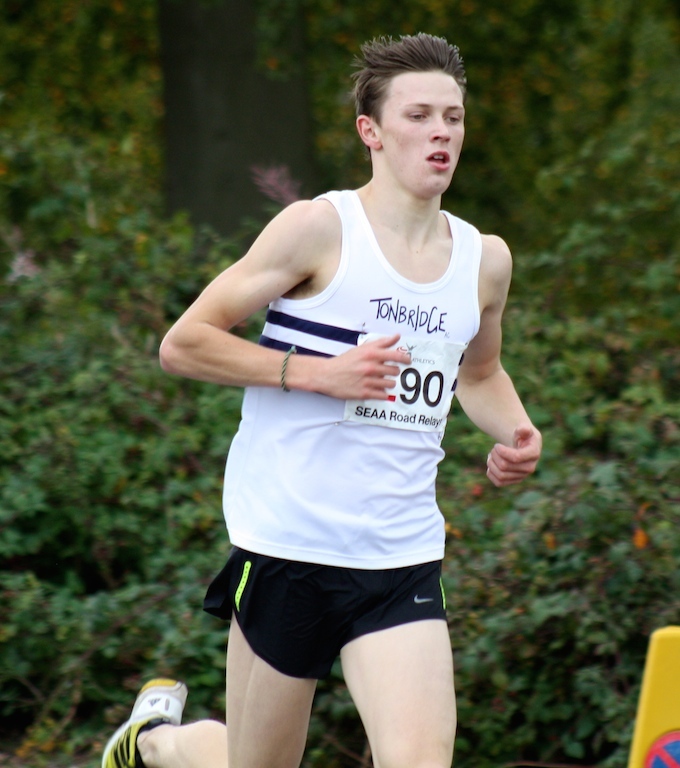 No Tonbridge team had ever finished higher than 22nd place in the prestigious National Road Relay Championships, until this year. The A-team consisting of Andy Combs, Charlie Joslin-Allen, Henry Pearce, Luca Russo, Ryan Driscoll and Laurie Probert, placed 12th. Four of the team were 18 years old, Laurie was 17 and Andy the 'old man' of the team at just 20, so hopefully there is still a bright future ahead. Sometimes an athlete runs totally out of their skin and throws the form book out of the window. This happened when James Puxty ran 10.23 for the first leg of the under 13 boys' 4 x 3000 metres road relay, at Aldershot. He ended up as the second fastest lap overall, running quicker than his team mates Charlie Crick and Tom Kendrick, whose pbs on the track are a lot faster. It is always an indication of a good performance when someone texts it through and I have to go back and double check that they haven't typed it wrong ! This is what happened when Charlie ran 1500 metres in 4.34.91 at Bromley on 13th August. Charlie's best had been 4.41.14 and he had raced a few times this season, so I wasn't expecting such an improvement. Charlie was only 11 at the end of April, so although he is now ranked 3rd on the UK under 13 ranking list, he still has another year in the age group. At the top of the rankings is Tom Kendrick, also from TAC, who prior to Charlie had been the fastest ever first year under 13 at the club. There were a variety of different noteworth performances in July. These included Robbie Farnham-Rose winning the English Schools 1500m title, Graeme Saker running a 2.06.74 for 800 metres, as an over 50 year old and Tom Kendrick once again lowering his club under 13 record to 4.23.34 (the 4th fastest ever u13 in the UK). Also there were some superb efforts to help teams out, such as Dominique Von Oppell's willingness to double 3000m/1500m in the National Young Athletes League. Some of the above have been nominated here before, so I have gone with an athlete who has improved from 4.50.1 to 4.24.56 at 1500m this season, which is Miles Weatherseed. Miles also was hit by a knee injury, caused in an accident early in the season, but came back strongly to run his latest pb at Watford. Jordan Saul - Reduces his 1500 metres personal best by 29 seconds and helps his training partner (Sean Molloy) to UK record and National title. In June there were some superb performances with Robbie Farnham-Rose and Sean Molloy winning National under 20 track titles, plus Sean setting a UK age 16 best for 800 metres with 1.48.24. Also others such as Chris Cohen, Gavin McKay and Leo Rossouw have demolished personal bests by huge amounts from last season. However, it feels appropriate this month to award the best performance nomination to Jordan Saul. Jordan not only reduced his 1500m pb during June from 5.02.44 to 4.33.33 but has been a major contributor to Sean's success. Living close by to Sean, it is often Jordan who will accompany Sean on some of his runs from home and also with some specific track sessions. Jordan's first sport has been boxing, which he continues to train for 3 times a week, whilst combining it with TAC training and his own runs maybe 4 times a week. He is also calm, unassuming and modest, so has been a real asset to the club and training group. At the start of the track season it is always interesting to see who has improved from the previous Summer. There have been plenty of TAC distance runners, who have done this significantly, but Ben Foreman does stand out. He ended 2011 with personal bests of 800m 2.09.6, 1500m 4.28.19, 3000m 10.00.6 and 1500m steeplechase 5.02.0. After a very solid Winter season he set about demolishing every one of his pbs and in May ran the following times - 800m 1.59.93, 1500m 4.08.37, 3000m 9.32.54 and 1500m steeplechase 4.40.78 (and 4.36.6 without a water jump). It is also safe to say that the 3000m time was achieved during a 'comfortable' National Young Athletes League win, so further improvement might be expected. For the first time the performance of the month goes to a team. The men's National 12 stage road relay squad placed 19th in these championships, which bettered the 28th from 2011. Prior to this the club had only ever once qualified and attended the championships and on that occasion had just eleven athletes. Half of the squad raced in the under 20 age group in 2011/12 so hopefully the club can continue to improve the placing over the next few tears. The full squad, as shown were - Tom Cox, Andy Walpole, Graeme Saker, Ryan Driscoll, Karim Habibi, Greg Cole, Luca Russo, Andy Combs, Chris Lloyd, Dan Bradley, Ben Cole and Jamie Bryant (not in photo). There were a host of top class performances in March and any of them could have been given the nomination as best for the month. 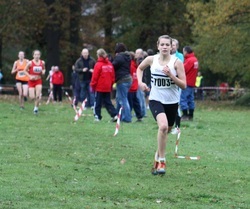 Nicole Taylor produced a stunning 8th place in the under 17 race, at the UK Inter Counties. Robbie Farnham-Rose was 3rd, at the English Schools and Charlie Joslin-Allen 5th, at the World Schools Championships. However, all three of these have won the performance of the month before. Then I could have given it to the men's 12 stage road relay team for finishing higher than any previous club team has ever done in the 'Southern' with 7th place. In the end I have picked Sophie Foreman, who had two performances that could have won it, with 10th at the English Schools and then 5th place in the home countries international, in Scotland. Sophie joined TAC last year, alongside her twin brother Ben and both have fitted in well with the training groups. Sophie quietly gets on with her training, but when it comes to races seemingly has the ability to up her game and perform well. The international vest was a just reward for a very good Winter season. February was a relatively quiet month in terms of races, but did include the highlight of the club's Winter season, the 'National'. There were some terrific TAC performances, including George Duggan winning the under 15 title. However, one performance stood out for a display of determination and bravery. Megan Brickell has had two years of injury and struggles and is still battling with regular tight calves. However, she has never given up hope, despite finishing races in some pain. At the National she managed to finish 53rd in the under 20 women's race, score for the team and help the club to it's first medals in this age group since the mid 1980s. There were some terrific performances in January, such as the above form runs at the Southern Championships by Nicole Taylor and Ryan Driscoll, but I still have the policy of identifying athletes who have not been mentioned in this section before. I came up with a couple, since Dan Bradley's 8th place in the Kent Senior Men's Championships was excellent. However, my pick this month is Charlie, who won the Kent under 17 title with some front running tactics and then a week later defeated, amongst others, the Kent under 20 champion, at the Kent Schools Championships. Charlie had a blip at the Southerns but I am sure he will be back to his best very soon. Ben Cole is having his best ever cross country season, at the age of 26 and has developed into one of Kent's leading distance runners. As an under 17 he 'only' ran 4.22 for 1500 metres, but has continued to develop as an athlete through university and also now that he is in full time employment. In December Ben finished 3rd in a Kent League behind Dean Lacy and Mike Coleman, for his best ever league finish. This is the 20th month of displaying the performance of the month and it is time that Luca was recognised. He has been an ever present in Tonbridge teams since joining the club in early 2006 and has worked patiently and harder each year in training. Luca's performances have sometimes been over-shadowed by his team mates, yet he is one of the best distance runners for his age in the UK, always being very close to the sharp end in races. At Liverpool, at the end of November, he took 13th place in a race loaded with every top young distance runner in the country, as they fought for places in the GB under 20 team for the European Championships. Behind him there were English Schools track and cross country champions, plus other internationals, demonstrating that it was probably his best performance to date. Hopefully Luca will be rewarded himself with an international vest in the future by GB or England, so he doesn't have to opt for using his Italian links ! Ellie Cohen was the first TAC athlete over the finish line on the day at the National Young Athletes Road Relays in October. 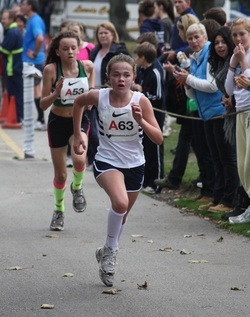 She was running the first leg for the under 13 girls' team and came home in 10th place, setting the team up to place 4th at the end of the three legs. Ellie ran 14.51 for the lap, which was an improvement of 2 minutes and 10 seconds over what she had run in 2010 ! Partly for this reason, but also for the fact that she was about 45 seconds quicker than we had anticipated, she wins this month's award. George has had some superb performances in 2011 and I often feel quite guilty for not giving him the 'award' for Performance of the Month' ! He should perhaps have 'won' it in August (see below), but Sean topped it with an amzaing run. Once again, In September, there were some terrific runs like Robbie's 1500m bronze medal at the Commonwealth Youth Games and Tom Kendrick running the fastest lap at the Southern Road Relays. However, George moved the under 15 boys' team from 14th place to 4th, just behind the bronze medal winners and ran the fastest lap. No doubt he could have gone even quicker than his 9.15, but for the fact that he was chasing so hard from the start, with superb determination. Sean Molloy won the National under 17 800 metres in 1.51.60 to break a 27 year old club record and also equal the UK age 15 record. To win a national title with still another year in the age group is quite an achievement, but to do this in both the English Schools Championships and the National Championships is something special. Somehow Sean managed to win this title even after a two week holiday at the start of August, although he did maintain fitness with steady running. 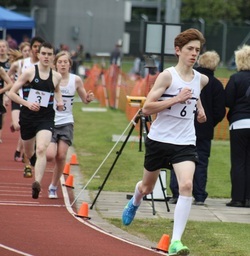 George Duggan also had an impressive month winning the National and Southern under 15 boys' 1500 metres titles and going to the top of the UK 800 metre rankings. So how do you pick the performance of the month for July ? At the English Schools Championships we had George Duggan breaking the longstanding TAC under 15 club record and winning the Junior Boys 1500 metres title. 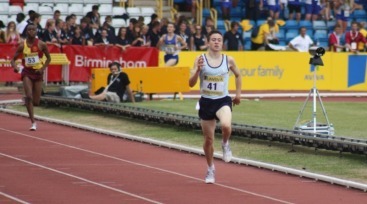 At the same championships Sean Molloy won the Inter Boys 800 metres, with still another year in the age group. George then may have even topped his English Schools victory by winning the 800 metres at the UK Young Athletes League Regional Final, defeating the English Schools Champion. Robbie Farnham-Rose can't be given the 'award' as he has won before, but in July he came 8th in the World Youth 1500 metres final. On top of this there were many superb personal bests such as Luca Russo's 3.55 for 1500m. However, the performance of the month for July should really go to Steve Fennell for winning the England Athletics Championship 800 metres title, which was formerly known as the AAA title, won previously by the likes of Steve Cram and Peter Elliot. Steve was the first TAC athlete ever to win a National track middle distance title, as a senior. He then went on to place 6th in the UK Championships at the end of July. There were some terrific performances in June, including Steve Fennell and Grace Nicholls winning South of England senior titles. However, I have gone for Ryan Driscoll's 2000m steeplechase as the best performance, as it was so unexpected. The Kent Schools kindly organised an invitational 'chase to help athletes gain a 'last minute' qualifying for the English Schools Championships and Ryan took advantage. He sliced 14.6 seconds from his best, to go alongside improvements this year of 5.6 seconds over 800m, 7.7s over 1500m, 24.2s over 3000m and a total of 58.8s over the 2k steeplechase. Ryan has worked really hard all year and trains regularly six days a week including doing all the Wednesday night circuit training sessions. Becky O'Hara - 600 metres in 1.40.9, a new club record, top of UK 2011 rankings and 12th fastest ever under 13 girl in UK. Nicole Taylor who went top of the UK under 17 womens 1500 metres steeplechase rankings in her 1500m 'chase debut. Robbie Farnham-Rose with 3-49.5 for 1500 metres, a World under 18 championships qualifying time. 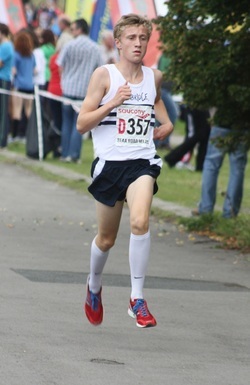 Sean Molloy won the Kent Champs under 17, 800 and 1500m, the former in 1-55.3. Then there was Ryan Driscoll taking 23 seconds from his 3000 metres best to run 8.46.23. In the end though, on the very last day of the month Becky O'Hara broke the club under 13 girls' record with 1.40.9, taking three seconds off the time she set in April. Becky's consistent training and willingness to do the 'dreaded' cross country season seems to have paid off, when added to her undeniable sprinting speed. When TK ran 77.3 for 500 metres in a biathlon a few weeks ago there were some doubters, but he showed that it is probably accurate this month. He ran 2-14.94 for 800 metres, which compares very favourably with Sean Molloy's Tonbridge under 13 record, the difference being that TK is a year younger than Sean was so he has this year and the Summer of 2012 to get it. He followed up with a 600 metres at the Tonbridge Easter Open Meeting ran in 95.75, which was a club under 13 record and the fastest ever in the UK for an 11 year old. Laurie came along to TAC at the start of the Autumn, at 16 years old. He has trained and raced with great determination all Winter. His first 'big' races at the Southern and National were a new experience for him and his results were not quite what he hoped for, although still very good. At the English Schools Championships in March he used the experience he had then gained to finish a superb 15th in the Inter Boys' race. Laurie is a good example to others that you don't have to start in the sport before your teens to do well and with hard work anyone can do well. His hopes for the track are centred around the 3000 metres, whilst he will continue in the under 17 age group for the Summer and next Winter. Greg Cole, surprising everyone with a fine race at the National. We had some notable performances in February, particularly from a team point of view. Luca Russo equalled Michael Mason's club record of winning five English National Cross Country Championship medals in a row, whilst Charlie Joslin-Allen had a fine win in the South East Schools Inter Counties. However, it seems fitting to highlight this month a member of the TAC 'National' senior men's team, who placed 17th, the highest in the club's history. Greg Cole's 258th was some 150 places higher than might have been expected, in a field of 1300 and helped produce the team result. Greg has competed through the age groups for the club, but is now showing his best ever form as a senior. 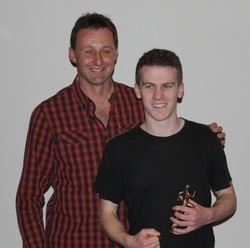 Photo of Greg receiving his award for the best TAC male performance at the championships, from Pete Mason. 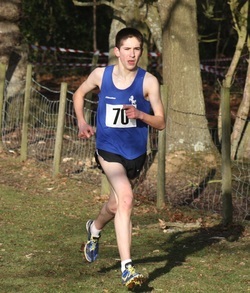 Max Nicholls, first TAC distance runner in 20 years to win a South of England Cross Country title. Max Nicholls captured the South of England Cross Country title at Parliament Hill, winning the under 15 boys' race by 12 seconds. However, the manner of his victory was even more convincing, as he pulled away, looking very strong. Max clearly has a liking for the venue at Parliament Hill as he finished second in the National there, as an under 13, two years ago. Max joined Tonbridge about 18 months ago, along with his sister Grace and younger brother Euan. They had previously been members at Ashford AC, but wanted to be part of a club that sends teams to championships like the Southern and National championships. Henry Pearce had his finest race to date, when he placed second in the under 17 men's event, at the South East Inter Counties Cross Country Championships. He was the only TAC individual medal winner at the event and was running for Surrey. He was only beaten by the current English Schools Cross Country Champion, Harvey Dixon, with just eight seconds separating them at the finish. The obvious choice for November might have been to pick Robbie Farnham-Rose's runs at either Mansfield, in the National Cross Country Relays (fastest u17 lap) and at the European under 20 trials at Liverpool (5th place, despite moving up an age group). However, he has been recognised here before, so Nicole's win in the Kent League gets the recognition. Nicole lives at Crowborough, so it is an hour's round trip to training and she has been really consistent. When she can't get to the club she invariably gets out to train by herself and this is paying off. In the Kent League she defeated girls who had beaten her earlier in the season to take the win. Alessia Russo's first choice sport might be football, but she is also a good athlete. However, at Sutton Coldfield for the National Young Athletes Road Relays she left us all shocked by her first leg run in the under 13 race. She turned the final corner in 5th place and then moved up one place to grab 4th, with what turned out to be the 9th fastest lap of the day. There were many other terrific runs in October, but this was probably the biggest surprise. Andy Combs came back after a few months out of action, with a niggling shin injury, to perform superbly in September. He firstly ran the fastest lap of the day at the Blackheath and Bromley AC cross country relays, but followed up a week later with a storming first leg at the South of England Road Relays at Aldershot. His 18.05 over the senior distance of 5992 metres was the 9th fastest leg overall and he is just 18 years old. Andy started at the club when he was about 11 years old and has consistently improved, before now making the transition from junior to senior. At the Tonbridge AC Evening Open meeting on Tuesday 3rd August, Lucy Reid made a breakthrough at 3000 metres, reducing her best ever time from 11-26.3 to 10-28.77. August is a strange month with many having had or taking holidays, so there are probably fewer top class performances. 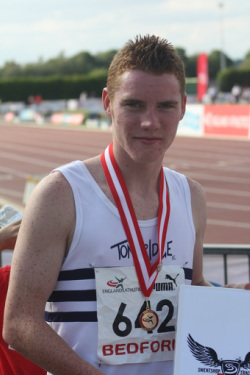 Sean Molloy won the England under 15, 800 metres title, which would have been worthy of the best performance, whilst he then reduced his pb at the club championships to 1-59.17 for a club record. However, I wanted to highlight a female performance, after four consecutive male ones, so have picked Lucy's run for this. Robbie Farnham-Rose wins English Schools Inter Boys 3000m with club record. July has probably been the best month yet. Grace Nicholls, Sean Molloy and Robbie Farnham-Rose have all won English Schools titles, whilst Hannah Czarnowski (600m) and Alessia Russo (1000m) have both broken under 13 club records. Robbie's race has probably been the most talked about at the club and few could argue that it is the performance of the month... so far ! His 3000m in 8-26.33, with a closing 1000m in 2.41 and last lap of 59.3, broke the club under 17 record and puts him 11th on the UK all time list in that age group. 4-04.21, 8-45.13 and 15-39.2. Last year he ran 2-09.72, 4-18.09, 9-18.5 and 16-20.1. James is 19 on 8th July and has often explained how he spent his first few years at Judd School being well beaten in races by many others. Even as an under 17 he only ran 5-00.06 in 2007 and 4-40.0 for 1500 metres, in 2007 and 2008 ! With a bit of dedication and consistent training he has developed into one of TAC's most versatile and dependable distance runners. In 2010 he has upped his training even more and sometimes has put in as many as 12 sessions a week. 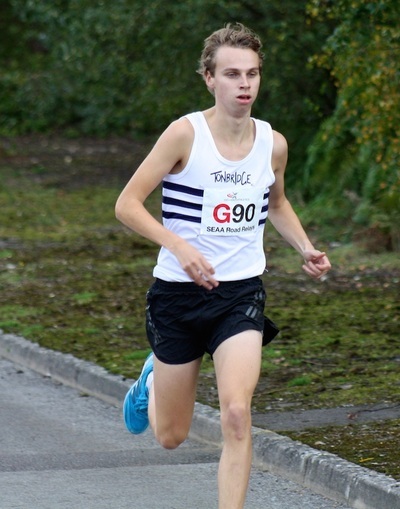 In the Autumn he is due to start at Nottingham University and we hope he will continue with his running and be a key member of TAC senior teams in the years to come. As a fan of tac distancerunners.com I know he will like this page ! Corey De'Ath took 13.5s from his 1500m pb running 4-21.30 on 22nd May. Running in the British Milers Club meeting at Milton Keynes, Corey simply followed the designated pacemaker for his race and then unleashed a very quick last 300 metres. This was selected as the performance for May, as the race was sandwiched between two other 1500s that he ran of 4.39.04 and 4-31.45 and was just such an unexpected performance. Tom twice lowered his personal best in April. At the start of the season it stood at 4-43.7 and he first lowered it to 4-15.22 on 18th April at the National Junior League. He then went even quicker at the British Milers Club race at Hendon on 24th April. His 4-11.35 was achieved with splits of 66.0, 66.3, 64.3 and 54.7. So why was that third lap so good ? Well, the officials rang the bell at 700 metres and Tom thought he was starting his last lap. Somehow, after crossing the line at 1100m, he realised the error and dragged himself around a final lap, to still record a pb ! In the photo Tom is approaching the 1200m point, with Luca closing him down.